This information is about two sisters, Caroline and Sarah URIDGE, who married, and together with their families, immigrated to Australia. Many thanks to Keri Webb and Kevin Brady of Australia, and Mary Gill of England for their co-operation and collaboration in compiling this information. Caroline and Sarah URIDGE were sisters, born into a family of fifteen children. 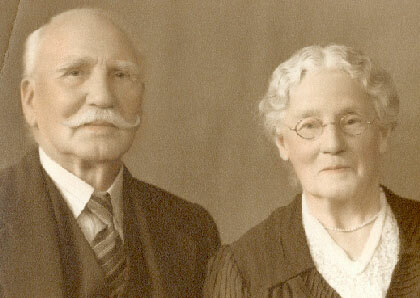 Their parents George and Frances URIDGE née LANE, lived in the North East part of Kent in the early part of the 19th century. Their parents married in 1790, in the same year that the Second Fleet arrived in Australia. They could not have realized at the time that two of their daughters would later become pioneers and founders of five generations of Australian families. Caroline URIDGE was born on June 10, 1810 at Hoo Common, Hoo, Kent, four months later she was baptized at St. Werbergh, Hoo, Kent. She married David WEBB son of Robert and Sarah WEBB née LAMB, on July 26, 1829 at East Malling, Kent. Sarah URIDGE was Caroline's younger sister and was born on April 13, 1814. Eleven days later, she was baptized also at St. Werbergh. She married William BAXTER on December 11, 1835 at St. Werbergh, Hoo, Kent. In 1838 both sisters, together with their families and Caroline's brother-in-law Robert WEBB, and his wife decided to immigrate to Australia. The families, a group of 12, joined the ship "Woodbridge" probably on April 22 or 23, 1838 at Gravesend where 127 passengers, chiefly labourers from Kent and Sussex were taken onboard. The ship then sailed to Cowes where a further 130 emigrants from Wiltshire embarked. The ship set sail to Australia, on May 7, arriving four months and 16 days later on Saturday September 15, 1838 at Sydney Cove. For an excellent account of their journey see http://www.xroyvision.com.au/andrews/history/hist4.htm. The families settled in New South Wales. Caroline and David WEBB had twelve children. David died on August 4, 1888 at Mittagong, New South Wales, Australia, aged 81, and 18 months later Caroline died aged 80 on December 5, 1890. Sarah and William BAXTER had only three children. William lived to the age of 92 and died on June 29, 1897, four days after his wife Sarah who died at the age of 83 on June 25, 1897. The two sisters must have been delighted when two of the grandchildren married each other. Sarah's granddaughter Ada PYE married Caroline's grandson David William WEBB on April 14, 1881 at St Barnabas, Sydney in New South Wales. In 1913, thirty years earlier a photograph was taken of the same couple, perhaps at a christening. 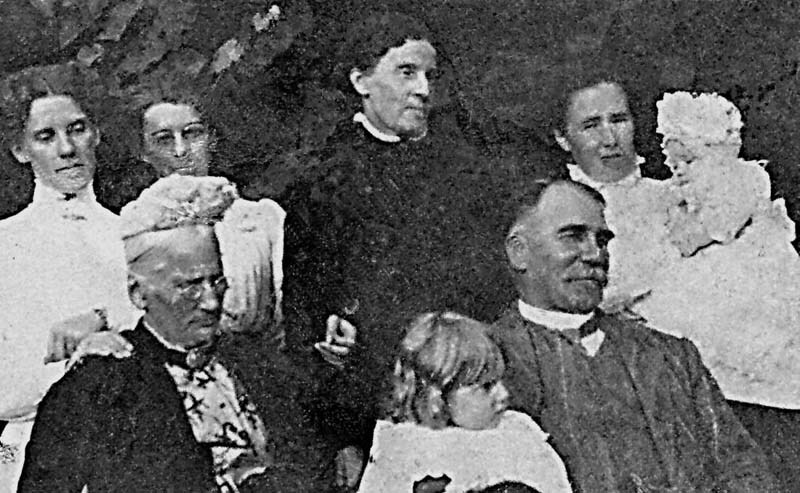 Back Row Left to Right: Rosa Beatrice WEBB (1882-1935); Myrtle Sarah WEBB (1888-1966); Ada WEBB née PYE (1860-1946); Annie Elizabeth WEBB née CORBETT (1881-1963) holding the infant Edgar Albert WEBB (1912-1987). This photograph, although not in very good condition, came from a collection of old photographs, and yellowed newspaper cuttings belonging to Keri Webb's aunt Ada (the young girl in the photograph). Keri writes "I first began to wonder why my Nana Webb had no husband. When I first saw these tiny crumpled faces stuffed into black and white space little of more than an inch high, they were simply, oddly dressed strangers. But as I read the history surrounding their times, their lives and backgrounds pulled, and still do pull me into their unfamiliar worlds, so that I can sometimes imagine that I have joined the league of Dr Who and become a time traveller". Starting back far right, Keri's paternal grandmother Annie Elizabeth WEBB (née CORBETT) holding my dad, Edgar Albert WEBB. Next is Ada WEBB née PYE, (who named a son Alvin Uridge WEBB), beside her are her daughters Myrtle Sarah WEBB, and Rosa Beatrice WEBB. Rosa has her hands on the shoulders of her maternal grandmother, Sarah PYE née BAXTER, (who named her last child George Uridge PYE). Then there is the infant Ada Webb (namesake of her paternal grandmother, the aunt who gave me this picture), who is held by her grandfather David William WEBB. Keri further says "As an aside - because my grandmother is the only family member looking at the photographer, I strongly suspect that the photographer is her husband, Percy Edgar WEBB, my grandfather." So this photo that straddles the generations is special to Keri, not only because here is her great-great-grandmother, the aged Sarah PYE, (who died some 20 months after the birth of Keri's dad) - but also because she can sense the presence of her "missing" grandfather Percy and that finding him, answered the question that posed itself to Keri right there in the beginning - why this Nana had no husband. It is a pleasure and a privilege to share these photographs, and Keri's thoughts and memories.